This bottle seems to have two distinct ‘main’ sides, although, of course, none exists on a cylindrical form. 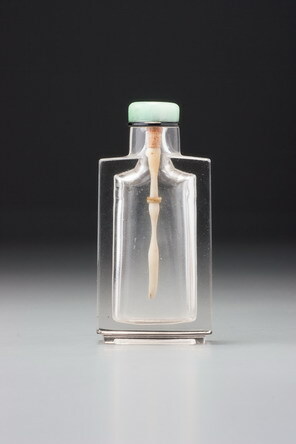 The effect of imposing a cylindrical form on the vertical striations of the material of this bottle naturally forms two long, oval panels set opposite each other. The vertical banding is then seen clearly as parallel lines only on the other two ‘sides’, which are, in any case, visually thinned because of the vertical lines, providing a distinction between ‘main’ and ‘narrow’ sides. This is of the rare snuff-pot form, which might be a mid-Qing formal innovation. What distinguishes this particular form is the invariably very wide mouth, requiring some of the largest stoppers in the whole formal lexicon of the snuff bottle. This is one of the most commanding snuff pots known, and one of the largest. It is of perfect formal integrity, and remarkably elegant, considering its basic cylindrical shape. A powerful part of this equation is to be found in the detailing of the neck, with its gentle flare and well-rounded lip balanced by a similarly flared and rounded footrim, which is only fractionally larger than the diameter of the neck.